Negotiations for a new City of Chicago member contract will begin formally on Monday, May 1, as Teamsters Local 700 representatives will be meeting with the city’s negotiating team to start the process. The committee will present the union’s full initial contract proposal to the city at the May 1 meeting. Local 700 has been meeting with city members and collecting contract proposals since the first steward meeting regarding the contract that was held on Aug. 23, 2016. Local 700 will also be negotiating as part of a coalition of the unions that represent all City of Chicago workers. There are currently over 30 individual contracts between the City of Chicago and various labor unions; all which expire June 30, 2017. The coalition is called “COUPE” and is led by the Chicago Federation of Labor. The union will be communicating with the membership more frequently as negotiations take place. Please stay connected with the Local 700 website for updates. City of Chicago Booters (Dept. of Finance) met at the meeting hall on April 6. 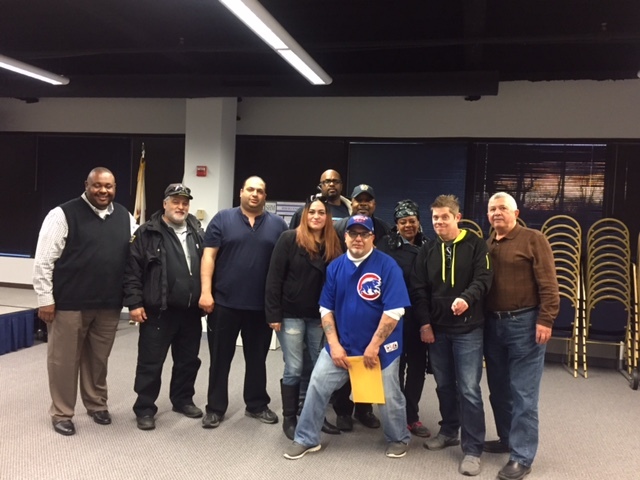 On Thursday, April 6, a group of nearly 35 rank-and-file city members, comprised of Booters and Garage Attendants, met with Teamsters Local 700 representatives and staff to discuss issues specific to their units what provisions they would like to have in the upcoming contract. Prior group meetings included representatives from virtually all of the departments represented by Local 700. President Strzechowski welcomed everyone to the meeting and all members at the table had a chance to share their contract proposals. Business Agents Harold Irving, Carlos Sanchez and Joe Belli were also in attendance, along with Jon Magna, a partner from Illinois Advocates. The Local 700 staff met with attorneys Jon Magna and Stuart Davidson (of Willig, Williams & Davidson) on Monday, April 17 to finalize the union’s list of contract proposals. Click here to read the April issue of the Teamsters Local 700 City of Chicago member newsletter.